I had not heard of them before, but apparently Shattered Sigh are active for more than a decade. They were formed as Black Whirlpool in 2006, and in 2010 they changed their moniker into the current one. Investigation, however, taught me that it was not that strange at all that I did not know them. There was only one official release until now: 2011’s untitled demo with songs written when the band was still known under their former moniker. Then things went silent, until last year. With a renewed line-up, this Barcelona-based band re-entered the Axtudio in order to record Distances. Six pieces were chosen and gathered as Distances, and this got released independently and digitally. But hurray (oops, a hollo of joy for a Doom-release; what going on?... ), Only Doom Metal Label Endless Winter took care of the physical release of this album. It’s a jewel case compact disc that includes an eight-page booklet with sober photography and the lyrics (which are in English), coming in an edition of 300 copies. After a short introduction, consisting of eerie soundwaves, distant church balls and the sound of wind (nah, who needs originality, if this introduction says it all), this Catalonian horde brings quite typifying Doom-Death Metal in a vein that holds the middle in between melancholy and harshness. This material – but what else did you expect – is ultimately slow and oh so melodious in performance. The basics are built upon melodious leads, tremolo riffs, and dual lead melodies. It surely sounds depressing, introvert, integer and sad, with a hint of funereal darkness. But it’s not just melodic; it’s enormously varied too, this approach. Every half a minute, something changes, evolves, sometimes expected, then again quite sudden. Breaks, interludes, changes in melodic structure, solos, semi-acoustic excerpts and so on – it truly is an adventurous thing, this Distances album. I wrote hundreds of reviews for albums within this specific kind of Music, and quite often I referred to a lack of originality. But at the same time, I did always add that one does not need any renewing material, at least in case when the result equals, or overpowers, the high level of other notorious acts. 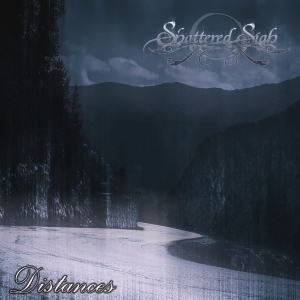 Distances by Shattered Sigh consists of all known ingredients: very deep grunts, the melodic guitars (as mentioned), an extremely forceful rhythm section (excellent drum patterns and fine bass lines), spoken words, acoustic and semi-acoustic excerpts, mesmerizing keyboards, piano, field recordings and sounds / samples (bells, elements of Nature like wind and thunder), some blackened screams, and so on, and so on. But believe me: in the end, this whole journey is truly of a convincingly high quality. Despite the lack of having an own face, it’s a pleasure to experience highly qualitative song writing and a crafted execution. The unhappy atmosphere feels all right, the sound quality is perfect (great production, with an equally divided mix of all instruments / voices, and a rich, warm and full result), and besides (or is it: thanks to) the huge variation, there is no room for boredom whatsoever. Fans of Evadne, Saturnus, Novembers Doom, Swallow the Sun, In Mourning, Slumber or The Fall of Every Season and the likes must pay attention!